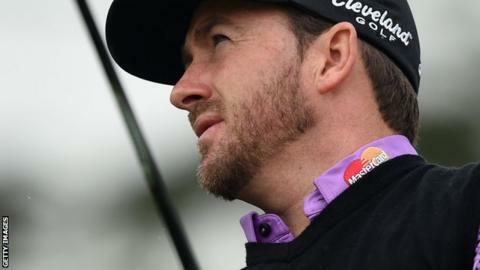 Graeme McDowell is two shots behind leader Alexander Levy after firing an opening five-under-par 67 at the BMW Masters in Shanghai. World number 17 McDowell didn't drop a shot as he carded five birdies at the Lake Malaren Masters course. Michael Hoey opened with a 70 although was left to rue a bogey at the difficult final hole. Shane Lowry joined Hoey on 70 while victorious European Ryder Cup captain Paul McGinley shot a 71. Frenchman Levy's round included five straight birdies as he continued his impressive season which has seen him winning both the China Open and recent weather-shortened Portugal Masters. Levy is a shot ahead of Argentina's Emiliano Grillo, Frenchman Romain Wattel and Belgian Nicolas Colsaerts. McDowell was the leading member of Europe's Ryder Cup contingent after day one. Thomas Bjorn and Jamie Donaldson both shot 68 with Victor Dubuisson on 70, Stephen Gallacher and Justin Rose both firing rounds of 72 and Ian Poulter on 74. The World Golf Championships-HSBC Champions is next week, also in Shanghai, followed by the Turkish Airlines Open and World Tour Championship in Dubai. World number one Rory McIlroy is taking time out to prepare for a multi-million dollar lawsuit with his former management company, and will not play again until the season-ending DP World Tour Championship. Northern Irishman McIlroy, who has won two majors this year, holds a lead of more than three million euros in prize money at the top of the Race to Dubai standings.